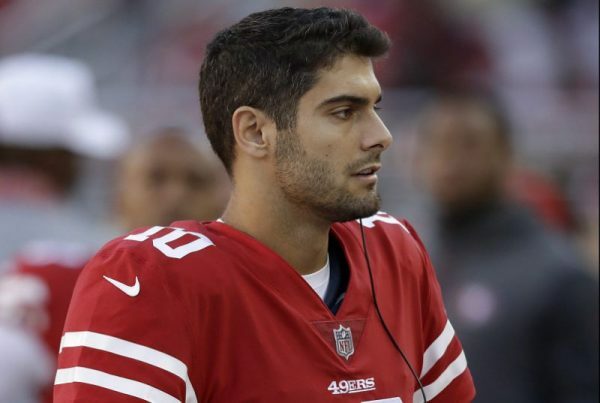 The early reviews on 49ers quarterback Jimmy Garoppolo have been nothing but sensational, as the team has won three straight and everyone in the Bay area is excited about the over 1000 yards he’s already thrown for in those three games. NFL.com has a great piece today on Garoppolo and what he’s brought to the table already for the team, here’s what some of the 49ers players are saying about the quarterback. Be the first to comment on "New 49ers Jimmy Garoppolo Drawing Rave Reviews From Teammates After Winning Last 3 Starts"